Founded in 1981, Flite Technology is a premier designer, manufacturer and re-builder of feed screws and barrels for the plastics, medical, rubber and food industries. 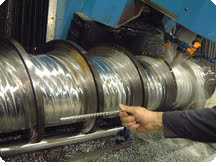 In addition to supplying feed screw, barrels and machine components, the Company is the exclusive source of a proprietary line of patented, highly accurate screw and barrel wear instrumentation devices. Flite Technology has an extremely large database of prints, drawings, and factory OEM specifications. Flite Technology has one of the largest combined engineering resource in the industry for plastic extrusion, injection and blow molding support. The Flite Technology client list includes a diverse group of companies ranging from start-up ventures to Fortune 500 corporations. All receive the same innovative service and personal attention that is Flite Technology. If your looking for a competitive advantage, advanced technology, and cost effective pricing, Flite Technology can provide the resources and expertise your business needs to meet the demands of today and tomorrow. Flite Technology has earned the reputation as an innovator and industry leader in the manufacturing of precision single and twin feed screws and barrels. Whether it's new, a rebuild, or a repair, you can be confident the quality and performance will be unsurpassed. Flite Technology completes orders quickly and cost effectively. Whether your firm is large or small, you can count on us to deliver high quality products, quickly and on time. We strive to exceed client expectations with all of our products and services. Comprehensive pre-planning insures all work is done in the most cost-effective manner. Detailed post-manufacturing inspections assure products leave our facility ready for trouble-free performance. Flite Technology is so confident of the superior quality of our products and services, we provide a one-year warranty on materials and workmanship on all products. Flite Technology offers a complete line of highly accurate bore gauges and wear measurement devices. Our Flite Mike micrometers are so advanced and easy-to use that even unskilled labor can measure screw, flights, diameters and depths quickly and precisely without supervision.